Healthcare Laundry Accreditation Council’s (HLAC) mission is to promote patient safety, prevent infection. As concerned healthcare officials in the United States continue to monitor the global Ebola emergency and its potential spread, the Healthcare Laundry Accreditation Council is urging its accredited laundries to maintain their diligence in following the safe laundry procedures set forth in its standards for processing healthcare textiles. The HLAC accreditation program was developed to meet the desire among many healthcare laundry organizations for an independent inspection and accrediting program that would result in formal recognition acknowledging that the laundry organization meets the high standards for processing healthcare textiles. No current program is as detailed as HLAC’s, or applies to all types of laundry operations: on-premise, co-op and commercial. HLAC is not in competition with, nor does it conflict with any other accrediting organization, including JCAHO. No neutral organization existed that could offer the program desired, so an industry task force created HLAC in July 2005. The HLAC board of directors was carefully recruited to represent all interested parties in the healthcare laundry industry: the laundries themselves, their employees, and, most importantly, their healthcare facility customers. No single voice dominates the board. It is truly independent and works in the best interests of the industry and its customers. The principal benefit of being accredited is that an independent third party has inspected your laundry organization and found that it meets the highest standards for processing healthcare textiles. A laundry organization cannot inspect and accredit itself, and its customers generally do not have the time or expertise to perform a comprehensive inspection as conducted by HLAC. 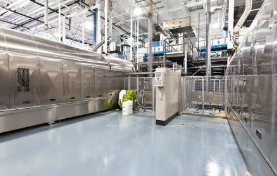 “The healthcare customer of an HLAC-accredited laundry can confidently expect a consistent and smooth flow of clean textiles; and, ultimately, the knowledge of safety for their employees and the end user – the patient,” Gicewicz said. In the wake of the Ebola emergency, the Centers for Disease Control and Prevention has provided Interim Guidance For Environmental Infection Control in Hospitals for Ebola Virus, which “cover topics related to waste, linens and recommended personal protective equipment for environmental services,” Gicewicz said. 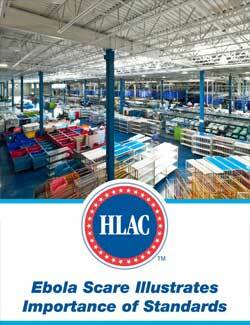 In addition to the CDC guidelines, Gicewicz said there also are HLAC standards and procedures that are particularly relevant to the Ebola emergency and can be found in Accreditation Standards for Processing Reusable Textiles for use in Healthcare Facilities, 2011 Edition, which is available at HLAC’s website (www.HLACnet.org). These include parts and sections pertaining to laundry facilities, laundry personnel, quality assessment, handling, collection and transportation of soiled healthcare textiles, sorting and washing and extraction. 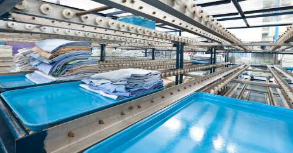 An HLAC-accredited laundry organization has demonstrated that the laundry organization managers understand and follow key government mandates for handling, processing and transporting healthcare textiles. In particular, the laundry organization is following OSHA’s Bloodborne Pathogens Standard to the letter. Additional, accreditation signals that the laundry organization is designed and maintained to provide for the health and safety of its personnel and that of the healthcare facility customer – the patient, that the personnel who handle healthcare textiles are properly trained, that the organization follows recommended “good industry practices” in its systems, policies and procedures that will provide the consistent delivery of healthcare textiles in the quality and quantity expected by the customer and that it is committed to excellence and challenging itself to meet the highest industry standards. Adherence to these standards and procedures would be essential if the Ebola outbreak were to spread to the United States with any consequence, Gicewicz said. The principal benefit to the healthcare customer is the knowledge and confidence that their textile provider is meeting the highest standards for processing healthcare textiles in the industry, including strict adherence to federal government regulations and guidelines. The customer can expect a consistent and smooth flow of clean textiles; and, ultimately, the knowledge of safety for their employees and the end user – the patient. As of July 1, the HLAC board no longer allows reaccreditation after a laundry organization’s expiration date. Organizations due for reaccreditation can be inspected at any time 60 days prior to and up to the expiration date of their current accreditation. Organizations that do not complete their reaccreditation during this timeframe will lose their accreditation. On the day after the accreditation expiration date, the laundry organization’s name will be removed from the HLAC website and all marketing stating they are HLAC Accredited must be stopped immediately. Inspections take one day and are comprised of two parts: a physical walk-through of the entire plant, and conference time in a quiet room for review of documents. Inspectors use a checklist that closely follows the Accreditation Standards for Processing Reusable Textiles for Use in Healthcare Facilities, 2011 Edition, published on the HLAC website. Each item is essentially a statement of fact and the inspector will mark “yes,” “no,” or “not applicable,” and add remarks as necessary.